9th January 2017, New Delhi: The recent media reports about access to Aadhaar data being available in the market for a meagre Rs. 500 has sent shock waves amongst active citizens. At the time when the government is pushing to link Aadhaar with all important documents like PAN, Voter ID, bank account etc. citizens have showed strong concern about the ability of Government agencies to protect their Aadhaar details. 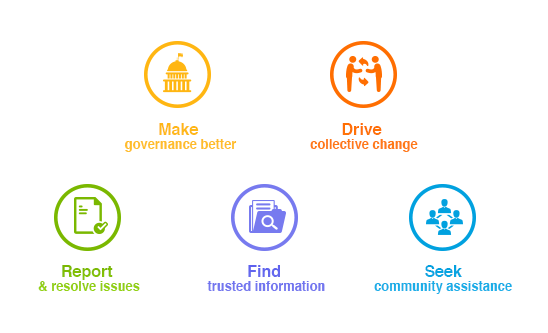 LocalCircles conducted a survey to check people’s belief in current mechanisms to protect their data and what should be done if it is compromised. The survey got more than 15,000 votes. 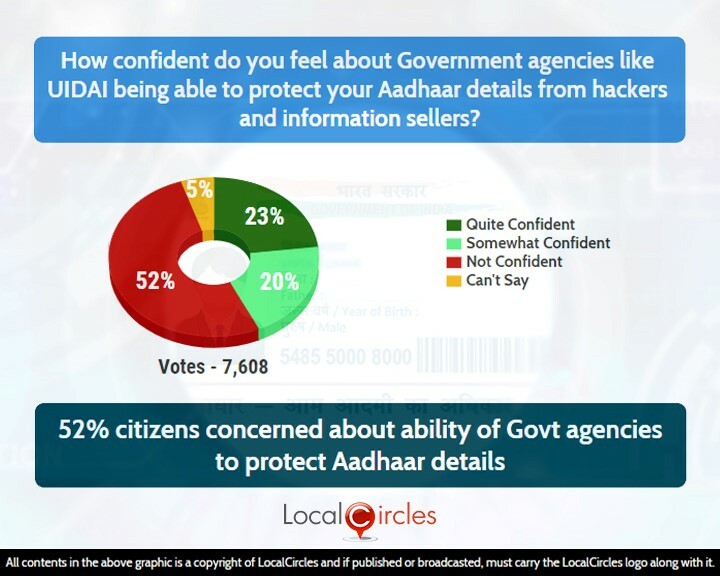 The first poll asked how confident they were about UIDAI and Government agencies being able to protect there Aadhaar details from hackers and information sellers. 52% said they were not confident at all while 20% said they were somewhat confident. 23% said they were quite confident and 5% were unsure. 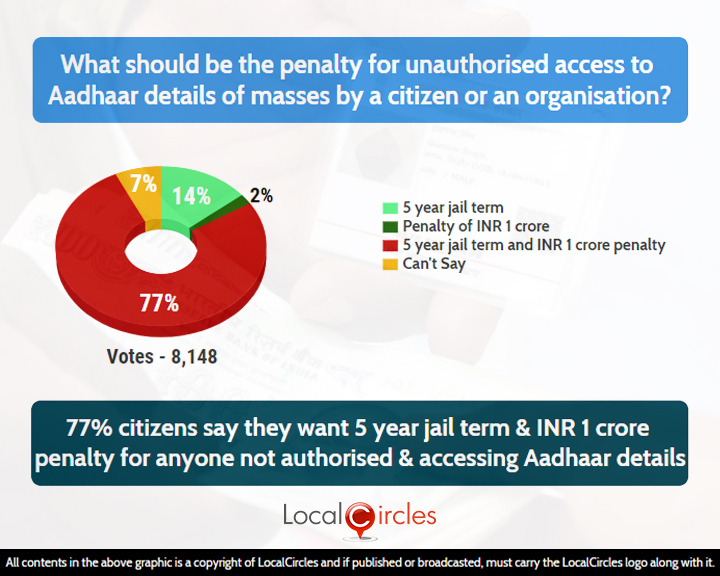 The second poll asked what should be the penalty for unauthorised access to Aadhaar details of masses by a citizen or an organisation, to which 14% said 5-year jail term and 2% said penalty of up to Rs. 1 crore. 77% said there should be a 5-year jail term as well as a Rs. 1 crore penalty. 7% couldn’t make up their mind. 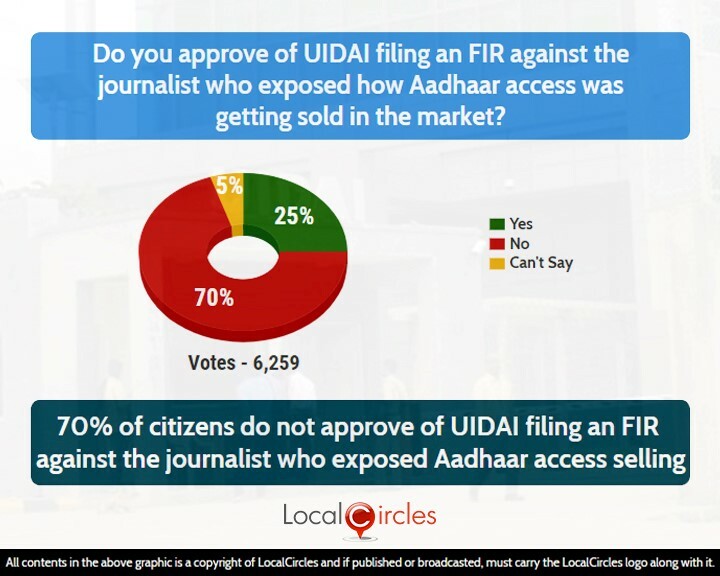 A related poll also showed that 70% of the 6259 citizens who voted, do not approve of UIDAI filing an FIR against the journalist who exposed how Aadhaar access was getting sold in the market. Only 25% said they approve of it. 5% citizens did not have an opinion. This is however not the only case of Aadhaar data being misused. UIDAI recently banned both Airtel and Airtel Payment Bank from using Aadhaar for doing e-KYC verification of their customers. The decision came after many people reported that the telecom major was using Aadhaar-based SIM verification of customers to open payments bank accounts without their explicit consent. The decision was later revoked, and Airtel has been allowed to use Aadhaar based e-KYC verification till January 10, 2018. The suspension order for Airtel Payment Bank still stands firm. The Rs. 138 crores which came into the Airtel Payment Bank on account of Direct Benefit Transfer for LPG was also credited back to the original bank accounts. 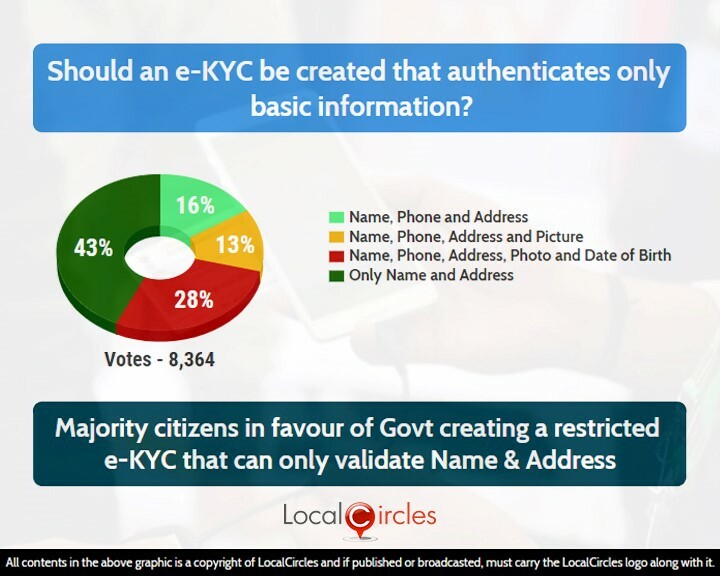 In a parallel poll, citizens were asked if an e-KYC be created that authenticates only basic information. In response, 43% said e-KYC should authenticate only name and address while 28% said it should be Name, phone, address, photo and date of birth. 13% said it should authenticate name, phone, address and picture, whereas 16% wanted it to be name, phone and address. Many consumers on LocalCircles had complaint that vendors receive all the personal details of the customer when they do an e-KYC using Aadhaar, even when they do not require the entire information. These include instant access to the customer’s address, date of birth, gender, mobile number and email address etc. Consumers are of the opinion that while applying for an e-KYC license, a vendor should first select the appropriate fields which are essential for them to provide service. UIDAI should provide access to only those details to that particular vendor through e-KYC. 2017 has been a year where many Aadhaar data leaks have been reported. From July when the Aadhaar details of 14 lakh pensioners was made public on the official website of Directorate of Social Security in Jharkhand, to November when the user Aadhaar details of more than 200 central and state government websites was made public. Consumers said that a restricted e-KYC would at least ensure that most of their personal information is safe.